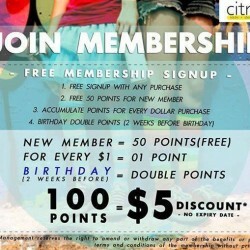 Join Citrusox Membership, Accumulate points and Redeem discount whenever you shop! Free Signup for all new members! New members get extra 50 bonus points, accumulate 100 points and we will give you $5 discount off your purchase! Available at Citrusox Retail Store only. Gear up for an exclusive sale from your favorite socks brand! 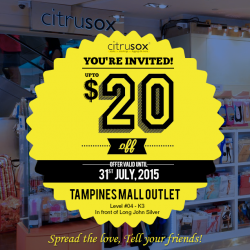 Enjoy discounts up to $20 at Tampines Mall outlet. Hurry! Offer valid till 31st July 2015 only. 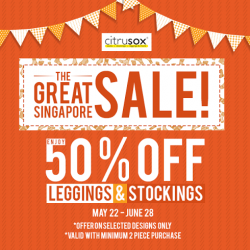 Enjoy 50% OFF for Leggings & Stockings at all Citrusox Retail Outlets! Valid till 28 June 2015. Terms and conditions apply.